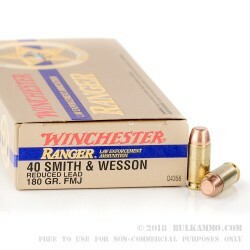 This 40 S&W cartridge from Winchester’s Ranger line of ammunition features reduced lead. 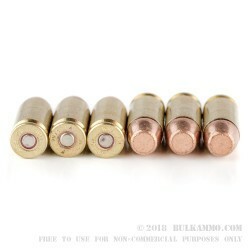 Its 180 grain bullet is fully enveloped by its full metal jacket, so hot propellant gasses can’t evaporate the lead in its core to create toxic gas, a problem of particular concern in poorly ventilated indoor ranges. 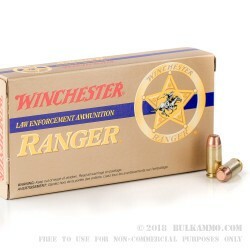 Its primer is devoid of lead as well, so you can enjoy a relatively safer shooting environment when you fire this round. The bullet’s flat tip suits it perfectly for target practice, as it will punch a more easily visible hole through a paper target to give you immediate feedback on your performance. 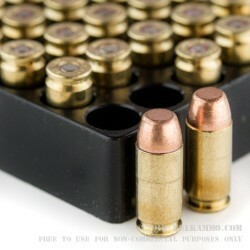 This cartridge additionally features a non-corrosive Boxer primed factory fresh brass casing, the ideal stuff to work with at a reloading bench. Winchester’s long-standing commitment to quality is clearly evident throughout this hard-working round, so an investment in 500 of them is bound to serve you admirably as you work on your aim.